On a brisk Saturday afternoon in late March, hundreds of protestors gathered in a grassy field at Lincoln Park in Grand Junction, Colorado, a conservative stronghold of the state. Dressed in red shirts emblazoned with the words “Students Demand Action,” student organizers handed out pre-made posters to attendees and practiced chants ahead of a student-led march. This march, which had hundreds of participants, was timed to coincide with thousands of other March for our Lives events taking place on main streets and in front of courthouses across the country. In Grand Junction, the protesters marched to the center of town to both the honks of approval from residents as well as shouts of “I love my AR-15” from a bystander or two. Young participants hold up their signs while they wait for the March for Our Lives rally to begin in Grand Junction, Colorado. The school shooting at Marjory Stoneman Douglas High School in Parkland, Florida, spurred activism by high school students across the country, including the creation of Grand Valley Students United, the student-led organization that hosted the march in Grand Junction. In this quiet city wedged up against Colorado’s westernmost border with Utah, students were called to action for another reason: They’ve experienced two school lockdowns in the past year, with the most recent scare — in which an unfounded rumor of a gunman running toward a local high school caused two schools to go into lockdown for nearly three hours — taking place just a few weeks after the shooting in Florida. “This could have been us,” said Rachel Fero, a sophomore at Fruita Monument High School, which was locked down. “It is coming to our schools. We are being affected and feel that we are the generations that need to make a change,” she told me while we waited for the march to begin. Here on Colorado’s Western Slope — where this protest took place a few miles from an AR-15 manufacturer — broaching the topic of gun reform is tense. Even as students elsewhere have called for sweeping gun bans, these high schoolers have tempered their message, a reflection of the fraught nature of the topic in this conservative community. “We are taking a very moderate stance as far as our platform goes,” said Spencer Hurt, one of the founders of the group. The Grand Valley students are calling for universal background checks, raising the age to purchase assault rifles to 21 and promoting safe storage of guns, among other gun safety measures. “We aren’t trying to ban guns. We aren’t trying to take away Second Amendment rights. We are just trying to promote safety,” Hurt said. But student activists have faced heavy criticism. Veniece Miller, a senior at Fruita Monument High School, said after she was interviewed by a local news station about the group’s decision to host a walkout in their school district, she was bullied on social media. “Many of (the commenters) were telling me that I don’t know anything, that I’m just a ‘Tide pod eater.’ That I need to jump off a cliff,” she said. The students are trying to take that conversation offline, where it’s most heated. Grand Valley Students United is organizing a town hall-style event calling on Sen. Cory Gardner, Rep. Scott Tipton and Sen. Michael Bennett to hear their concerns. Their objective is to capture the differing views in the region, “ensuring that elected officials hear our voices and do not ignore this part of the state,” Hurt said. They hope the discussion, which will be held at a local university in May, will bring together community members with different perspectives. “(We want) to make sure that (community members) are open to having a conversation,” he said. The students also hope the event will be a chance to clarify what the group’s stances are on gun reform efforts and diffuse some of the heated rhetoric accusing them of attacking the Second Amendment that has sprouted in the days since the march. 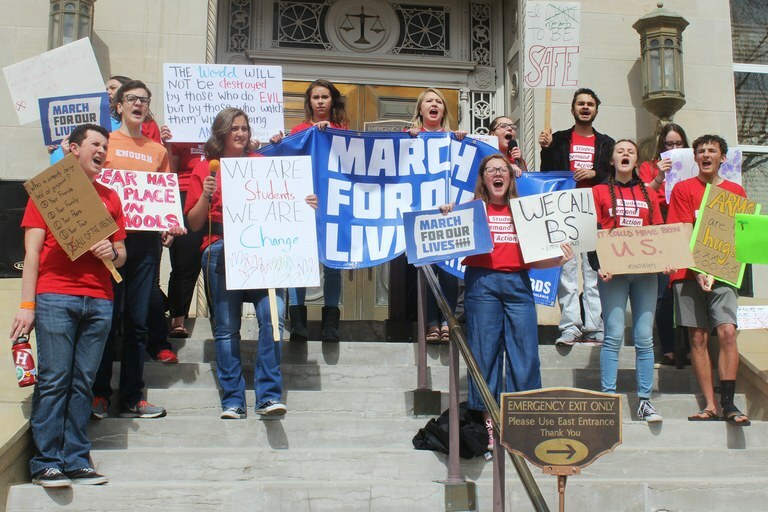 Student organizers lead a chant in front of the county courthouse at a March for Our Lives rally in Grand Junction in March. There are signs that the region is beginning to shift on gun law reform. Izzy Brophy, a local high school student, said she’s seen friends from conservative families support the movement, including some of whom came to the march and had to lie to their parents. “It is really heartening to see students work outside their parents’ perspectives because it is hard to do that,” she said. 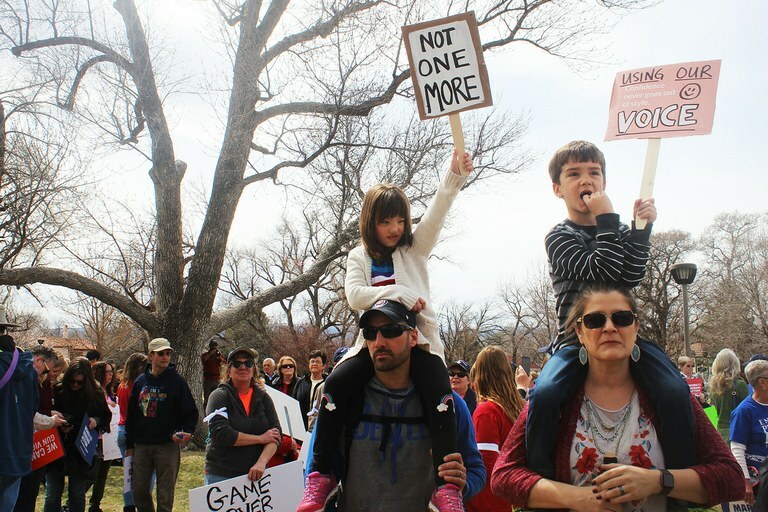 And the calls for gun reform go beyond the students: The march attracted a sizeable older crowd from Grand Junction and surrounding communities. The city’s school district also has been supportive of the students’ right to protest, facing down criticism from parents and community members. One resident expressed their thoughts about the district’s stance in a letter to the editor published in the local paper. “Recent student walkouts tolerated by District 51 officials prove that no one is teaching world history or American history to these teens who are asking to have their constitutional rights taken away,” the commenter wrote.